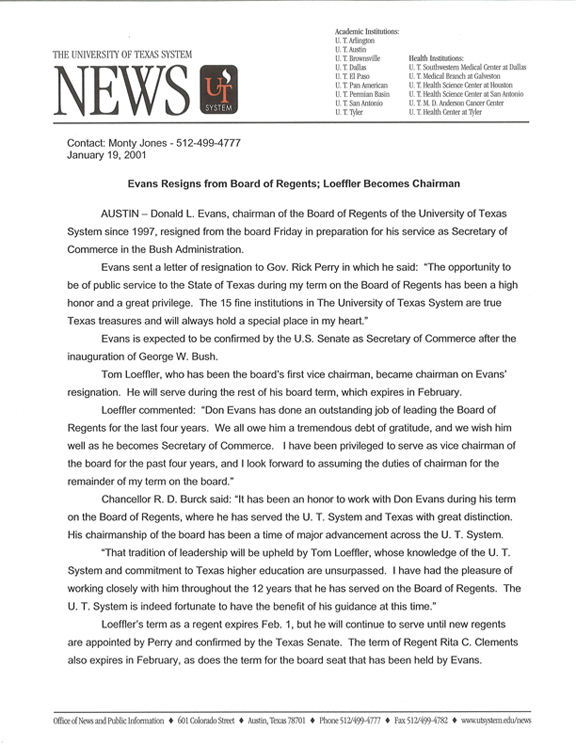 DONALD L. EVANS of Midland was appointed to a six-year term on the Board of Regents of The University of Texas System by Governor George W. Bush in February 1995. The Board named him Chairman in 1997 and reelected him in 1999. He resigned from the U. T. System Board of Regents in January 2001 after being named U. S. Secretary of Commerce by President George W. Bush. Mr. Evans was chairman of the board, president, and chief executive officer of Tom Brown, Inc., an oil company, and a director of TMBR/Sharp Drilling, Inc. He is a member of the Independent Petroleum Association of America, co-chairman of the Midland Wildcat Committee, and a director of the Permian Basin Petroleum Association and the Permian Basin Petroleum Museum. He also is a member of the Young Presidents’ Organization-49ers and the Rocky Mountain Oil and Gas Association. Mr. Evans, a native of Houston, is a graduate of Memorial High School in that city. He holds two degrees from U. T. Austin -- a bachelor of science degree in mechanical engineering (1969) and a Master of Business Administration degree (1973). Mr. Evans has been active in numerous civic groups and non-profit organizations. He is a member of the board of governors of Bynum School in Midland. From 1990 to 1994 he served as a trustee of Memorial Hospital and Medical Center in Midland, and he is a past chairman of the Beefeater Ball of the Midland Cerebral Palsy Center. He serves on the board of the Scleroderma Research Foundation of Santa Barbara, California, and he has been active in the United Way of Midland, the YMCA, and Young Life of Midland. Mr. Evans has been a member of the College of Business Administration Advisory Council at U. T. Austin since 1989. While a student at the University, he received the Texas Cowboys’ Bill McGill Award and was a member of Omicron Delta Kappa and Sigma Alpha Epsilon. He was chairman of the 1995 Texas Inaugural Committee, which organized the inauguration activities for Governor Bush. Mr. Evans is active in First United Methodist Church of Midland. He has been chairman of the church’s finance committee, administrative board, and staff/parish relations committee. Mr. Evans is married to Susan Marinis Evans. They have three children.